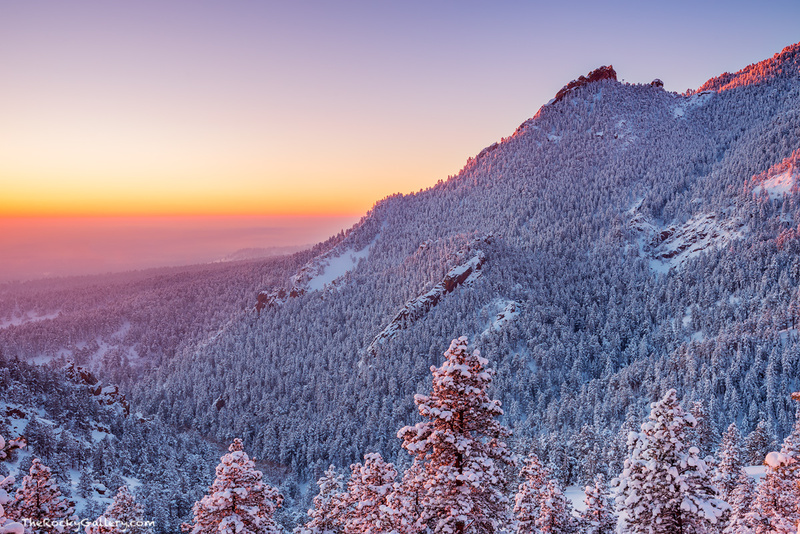 The snows that blanketed the Flatirons of Boulder,Colorado have moved out overnight leaving only a powdery layer of fresh snow on the evergreens that flank the mountainsides of Flagstaff Mountain, Gregory Canyon and The Flatirons themselves. A low hanging inversion layer still covers most of the lower elevations around Boulder and Denver this particular morning but as the sun rose above the cloud layer, it painted the Flatirons in a beautiful warm glow. Photo © copyright by Thomas Mangan.